Posted November 5, 2012 by Joel Goldman & filed under Competition. 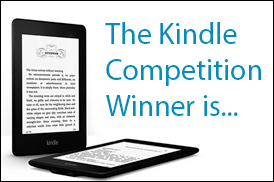 I’d like to thank everyone for taking part in the Kindle PaperWhite competition in October, the response was almost overwhelming. The numbers have been counted and I’m please to announce the winner of last months competition for a Kindle PaperWhite is… drum roll…..
A nice new Kindle PaperWhite and copies of the Lou Mason and Jack Davis series are winging their way North. Congratulations Paul and thank you all for taking part. Next month i’m giving away a whole series of Audible books, so make sure you stay tuned.